It is replaced by the Datalogic Magellan 8300. 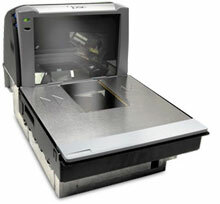 The Datalogic Magellan SL is the SlimLine family of 360-degree scanners from PSC. Unlike some dual-plane scanners with their "blind spots, " Magellan SL can simultaneously read the bottom and all four sides of store items - a full 360 degrees. An enhanced optical design has been combined with Datalogic's EDGE advanced decoding software, making Magellan SL the right choice for increased throughput, checker productivity, and profitability. The Datalogic Magellan SL has a stainless steel top and sapphire glass window designed to last the life of the scanner. Internally, the light-weight facet wheel, single VLD, and advanced motor design deliver high reliability on the most critical components. Together these extra-durability features ensure dependable performance for many years to come.